Earlier this month, a team of investigative reporters from Global News, the Toronto Star and the National Observer, broke a story: the Alberta Energy Regulator (AER) – or at least one of its senior managers – estimated cleanup costs for the province’s oil industry at $260 billion, eclipsing its official $58 billion figure by almost five times. The regulator was quick to respond with a statement backing away from the internal estimates, assuring the public it was not validated, and based on a hypothetical worst-case scenario of an immediate and complete industry shut down. That Alberta’s oil industry has been permitted to accumulate billions of dollars in cleanup costs over several decades is problematic in itself. But the more immediate problem, one that should concern Albertans of all ideological and political affiliations, is the gross lack of transparency on the level of risk facing taxpayers, who could be left on the hook for a portion of that cleanup bill. Alberta’s government has a long-standing transparency problem when it comes to oil and gas liabilities. The internal estimates, which exceed the AER’s official number by over $200 billion, illustrate this. While they have reassured the public the real figure is the official $58 billion, which is enormous on its own, there is no way for anyone outside the regulator to verify either number. The internal document, obtained by journalists through a freedom of information request, was a slide deck from a presentation on liability challenges by the AER’s vice president of Closure and Liability, Robert Wadsworth. 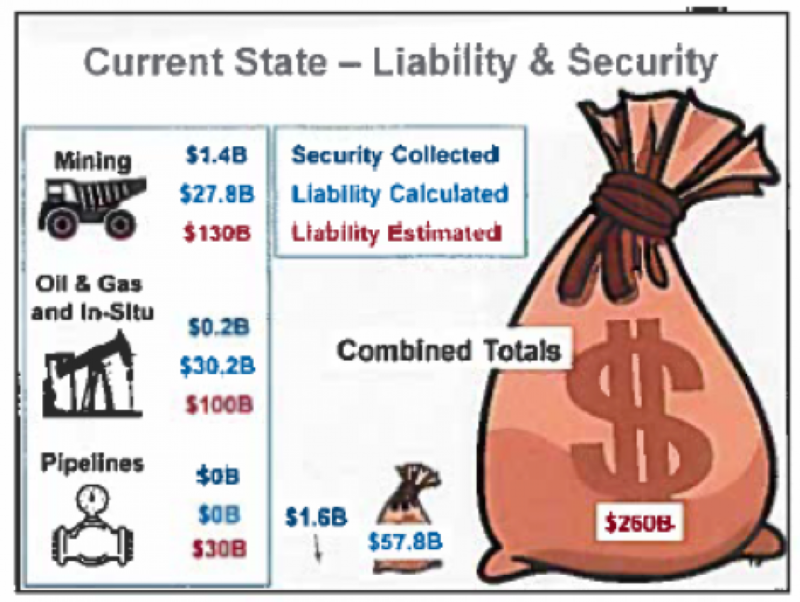 Graphics in the document break down the $260 billion figure: $130 billion to clean up the oilsands mining sector (including a small fraction for coal mines), $100 billion to recover conventional and in-situ operations, and $30 billion for pipelines. Commentators have been quick to point out the likelihood of Alberta’s oil patch evaporating into thin air tomorrow and leaving taxpayers on the hook for the entirety of the liability bill is very low indeed. Alberta’s environment minister, Shannon Phillips, said the numbers “reflect a hypothetical scenario” of an overnight industry shut down. The document’s speaking notes, however, contradict this, saying instead the $260 billion price tag is “likely less than the actual cost” and the “number is expected to grow as more data becomes available.” By comparison, the government has collected only $1.6 billion in security to protect taxpayers if companies go bankrupt and leave their mess behind; a poignant point in light of the Redwater case currently being heard by the Supreme Court. While abrupt shutdowns are implausible, there is a real risk that unforeseen circumstances – from trends toward decarbonization to disruptive changes in markets and technologies – could cause the industry to face significant changes in the coming years, and some unknown portion of these billions in backlogged liabilities could indeed become a public problem. What is wholly unacceptable in the government’s response are assurances the internal figures merely represent a doomsday scenario, which Albertan – and Canadian – taxpayers should unquestioningly disregard. While the AER’s statement appears to have quelled interest from the media, it has done little to address the real problem: a serious lack of clarity, transparency and access to information related to liabilities in Alberta’s oil and gas sector. Does the regulator itself even know how much liability the oil patch carries? Perhaps the most concerning piece of Alberta’s liability puzzle is the question of how much information the regulator itself can access. The only official information released to the public concerning liability estimates are single-line totals for both the conventional/in-situ and oilsands mining sectors. That internal estimations exceed these official totals by over $200 billion suggests the regulator may be working with patchy data. Indeed, under the Mine Financial Security Program (MFSP) standards, operators’ liabilities are reported to the regulator annually in one single-line statement. The AER can theoretically audit those numbers. However, there is no publically available data on whether any company’s reported numbers have actually been audited, nor results of such investigations. Similarly, in the conventional and in-situ sectors, risks are calculated using the Liability Management Rating (LMR) system, which generates a simple ratio between a company’s listed assets and liabilities. Many experts, however, say the system’s methodology is fundamentally flawed, systematically overestimating assets, underestimating liabilities, and failing to account for a company’s financial health. The question of how much information the government itself has on oil and gas liabilities is especially concerning when considering the projected cleanup costs of sites facing significant uncertainties, such as oilsands tailings ponds. The AER publicly estimates Alberta’s mining sector liabilities at $28.35 billion total, including some $27 billion for oilsands reclamation. Yet it is unclear how this estimate reflects ongoing technical uncertainties associated with the challenge of treating and reclaiming the 1.4 trillion litres of fluid tailings that have accumulated on the landscape over the last five decades. While industry has invested billions of dollars in addressing the problem and fostered research through the Canadian Oil Sands Innovation Alliance, projections for oilsands cleanup carry a legitimate risk that final outcomes may not pan out according to today's best-laid plans. It's like having your basement flood with a unique substance when a contractor is doing renovations, and they estimate clean-up costs based on some technologies still in the design stage, and others with a history of resulting in poorer outcomes and higher costs than anticipated. As a homeowner, it would be both fair and reasonable to demand precise details on how the contractor’s cost estimate was calculated. 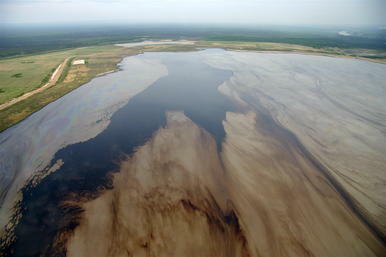 When it comes to tailings clean-up, despite numerous uncertainties, there is virtually no public data available on liabilities held by specific producers or operations, calculation methodologies, mitigation and contingency plans, and assumptions regarding clean-up technologies and final landscape outcomes. Whether the true cost to clean up Alberta’s oil patch is $58 billion or $260 billion, it poses a major environmental and fiscal risk for the province in the coming decades. Policymakers routinely balance the competing objectives of generating jobs and income from economic activity, with protecting society from bearing the costs of development. For five decades, promoting oil and gas development in Alberta has been favoured by allowing relaxed cleanup regulations and minimal financial security requirements to offset liability risks. Alberta now finds itself in a situation where backlogged liabilities have ballooned, and it has become necessary to begin deflating them to avoid a fiscal reckoning down the road. Long-term solutions to the problem require collaborative solutions that engage industry directly, to ensure we can reduce the oil patch’s liability load without pushing companies into bankruptcy and immediately exacerbating the problem. Before we can chart solutions, however, we all need – and deserve – to be on the same page when it comes the scale and scope of the problem itself. The Alberta government has an obligation to both collect and release detailed information on the risk that oil and gas liabilities pose to investors, to industry and to itself – that is, to all Albertans. Jodi McNeill is an analyst with the Pembina Institute, with a focus on fossil fuels in Alberta.